My new guest room quilt, finished, done, completed!! Yahoo! My next quilt is partially done and in-waiting and has been for a long while, but I got stuck. I wasn't sure how I wanted to quilt it. What is now clear to me is that I'm like a beginning quilter in many ways, going from hand quilting or tied comforters to machine quilting. Like everything in my life, I'd like to be an expert without taking the time to learn and practice, to be good at something instantly! It does sound nice, right? I am finding that I am not alone! Many quilters are good at piecing or quilting but not both and hire out what they aren't good at. I want to master it all and take pride in completing a quilt start to finish! My mother died years ago and she preferred quilting instead of piecing and we made the perfect team as she would be too happy to finish my quilts. She was an expert quilter but started failing physically before she finished her last and most beautiful quilt and I am "in training" to not just finish her quilt but the many others that I have started and not completed. Getting smarter, I have realized that some of my quilts will need to be machine-quilted or leave them for my daughters to complete, but the real problem is not just completing them but wanting to do them as beautifully as my mother would have! Perfectionism is indeed a terrible burden! I have bought a little sign that hangs near my work table that reads, "Finished is better than perfect" and took the plunge--to teach myself how to machine quilt. It is not as easy as it looks for someone that isn't a natural machinist and sadly a long-arm quilting machine isn't in my budget. I have seen what some quilters have produced on a simple straight-stitch basic machine and if they can do it, why can't I? I started my task to become an expert machinist by first doing my piecework by machine. Doing simple patchwork duvet covers, I then pieced some quilt tops and now I am moving on to machine quilting using Quilt-as-You-Go" techniques. This is simply quilting a quilt in pieces and then joining pieces together to make them bed-sized. I have learned through sewing hundreds of pincushions and fleece socks that to master skills, it simply takes patience, perseverance and practice, practice, practice! I am, after all, a perfectionist, but quite an imperfect one! I am inspired by quilts on Pinterest or at quilt shows and know thatI want mine to look as good as their's, BUT I just don't seem to have what most good machine sewers have, though I have seen improvement with practice. It was just the same at learning piano, I played only the first few lines of every song! Last week, however, I found a video on Pinterest. It was a special instruction class for people like me, titled Three Things Quilters Should Stop Doing by Angela Walters. It was a class on appreciating yourself and your own work and some firm and simple directions for quilters like me who don't value themselves or their work IF it is not perfect! Each quilt has a purpose, she said. This made sense to me, as I have learned that each person does as well. So whether our quilt is to be a gift or simply an exercise to learn, it is helpful to identify it's purpose. I thought to myself, "so loosen up Jane girl, not all quilts are meant to be ribbon winners at quilt shows!" They still have value and didn't I decide to make this quilt to be a utilitarian one to save the wear and tear on my special hand-made quilt?! Angela also pointed out that favorite quilts are often not favorites because they are perfect. It was like someone took a hammer and opened up my heart and brain with a brand new thought!! I immediately realized that though I was making a utilitarian quilt, I could simply focus on learning a new skill or two with each quilt. 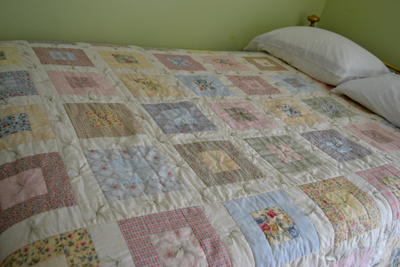 My guest bed quilt was made to practice stitch-in-the-ditch quilting. My guests will be equally as warm using a quilt with less and not more stitching! The other purpose of this quilt was to experiment on quilting the top and batting together and then tying it to a whole- piece backing. I stopped my quest for perfection and gave myself permission to make a simple and functional, but pretty quilted comforter. How many "labors of love" turn into a "labors of drudge" for me as I forget their purpose. I am learning and practicing a few new skills with each one! I also learned to NOT focus on and announce my mistakes to others. Imperfections are glaring only to me, but not to others! I need to allow myself to have beginner's quilts and quit picking at them until I create holes in them! I will instead work to make each quilt will be a bit better than the last! This instruction video also taught me that nothing has to be perfect in order to be loved. "Duh!!" Just look at myself! I have a very dear husband and if that isn't proof enough, I don't know what is! I am imperfect and loved all the same and so are my creations that my children love merely by the fact that I made them. My children themselves are testimony to that fact...they are loved because they are uniquely mine ...and so my quilts will be as well. Can you find three errors. I couldn't until Holly pointed them out to me! 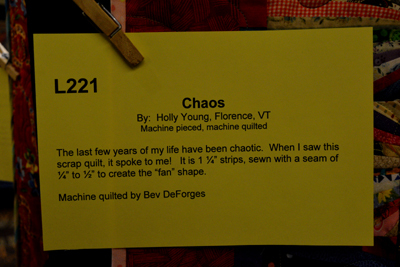 A good lesson: Holly accepting her life and her three mistakes in her quilt.! At our local quilt quilt show, I was drawn to a very bright and fun scrap quilt and then saw my friend standing next to it. As I complemented her on her quilt, I told her that I was laboriously learning to machine quilt and told her what I had learned about "letting go of the goal of perfection" and finishing my quilts. She smiled and said she had learned the same on this quilt and then generously pointed out her three mistakes and laughed as she added, "they are not small ones either"and yet I never would have noticed them! 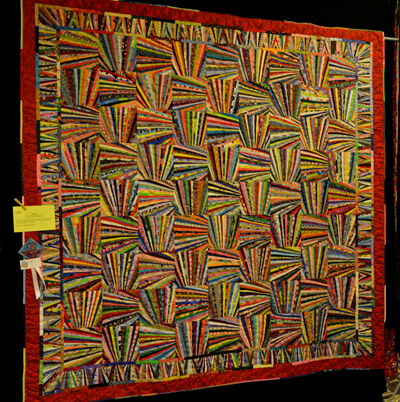 She said that her quilt reflected her life, which was in chaos and just as she accepted the state of her life, she accepted the imperfections in her quilt. She said she couldn't be bothered to replace imperfect blocks and simply patched them in one way or another and went on to finish her piece and then she took it in to have it professionally quilted by someone with a long-arm quilting machine. She showed the professional quilter her errors and simply said, "Do the best you can despite them". My friend is moving on with her life and not allowing herself "to get stuck", and she moved to complete her quilt in the same fashion. I loved her quilt and her as well! I also realized that I may not reach perfection in my quilts ever, but they are each extensions of myself, to be loved, valued and respected for their own worth. Each will serve a purpose. I then remembered reading that expert Amish quilters often add a block that is "off" either in color or design as a reminder that only God is perfect and dares to be a perfectionist, but I smile when I think of his creations; perhaps God, himself isn't a perfectionist either?! Labels: Perfectionism. No perfect quilts. A Quiet Time, a Welcome Change!